This short trip takes us from the sleepy Laotian capital of Vientiane, to the river side town of Vang Vieng set to the backdrop of towering limestone cliffs, to the UNESCO world heritage city of Luang Prabang. We visit glittering temples, explore vast caves and underground caverns, witness monks collecting alms at sunrise and discover natural blue waterfalls, all in 8 days. This trip can also be combined with our Inside Vietnam and Cambodia Highlights trip, for a comprehensive tour of Indochina. Arrive into Vientiane and check-in at the hotel. Located on the banks of the Mekong River, the Laos capital is a friendly town where we find weathered French Colonial mansions, stunning temples and steaming noodle stalls. A Beer Lao by the river at sunset is the best way to end the day, start your adventure and meet your fellow explorers. This morning we include a sightseeing tour around the city. This is a low-built, red roofed attractive capital city, with a French feel and a relaxed atmosphere. We explore some of the best sights including the Victory Gate which is a Triumphal Arch with good views of the town, the That Luang stupa which is said to contain a hair of the Buddha, and Wat Sisaket, a beautiful temple packed with fine Buddha images. This afternoon is left free for further exploration. It is possible to visit nearby Buddha Park, a vast green expanse just 30 minutes from the city that houses a beguiling selection of Buddhist and Hindu statues. Alternatively you may choose to visit the COPE Museum, a not-for-profit organisation set up to provide prosthetic limbs to the many victims of the unexploded ordinance (UXO) left behind from the Vietnam war. The museum does an excellent job of giving some of the background to the bombing campaign, along with showcasing the important work the COPE foundation is doing. Most report it to be a sobering, emotive but rewarding experience that enhances one's understanding of this fascinating country. This morning we make the short three to four hour drive to Vang Vieng. There are some interesting stops to be made en route, including visiting the Sa paper project where traditional paper is made from the bark of a Mulberry Tree. Upon arrival in Vang Vieng, the afternoon has been left free to explore our new surroundings. We recommend a short stroll down to the riverbank this evening in time for sunset, where there are a number of areas to sit and take in dramatic scenery. Watch people float down the river as the sun starts to dip behind the mountains and the sky turns a deep burnt-orange, just be sure to bring a camera to catch some sunset snaps. Vang Vieng enjoys an idyllic setting. Perched on the banks of the Nam Song river it is surrounded by a patchwork of lush rice paddies and set to a backdrop of towering jagged limestone cliffs. Once known as a party-town for backpackers, present-day Vang Vieng has now re-invented itself as the home of adventure travel in Laos, where its setting lends itself to a host of activities for anybody from casual walkers to adrenaline thrill-seekers. As there is plenty of choice available, today has been left free to choose from a number of optional excursions, such as a guided walk past rice paddies to nearby minority villages, a visit to the 2km underground cave network, zip wiring through the forest canopy or kayaking along the gentle Nam Song river. Today we spend a full day driving north to Luang Prabang. The journey winds its way up into the mountainous region of central Laos, passing ramshackle villages that cling to the side of the mountain road, and driving over several high passes with stunning 360 degree views. There will be regular breaks to the drive, stopping for refreshments in a Hmong village and for photos on top of the high passes we drive over. 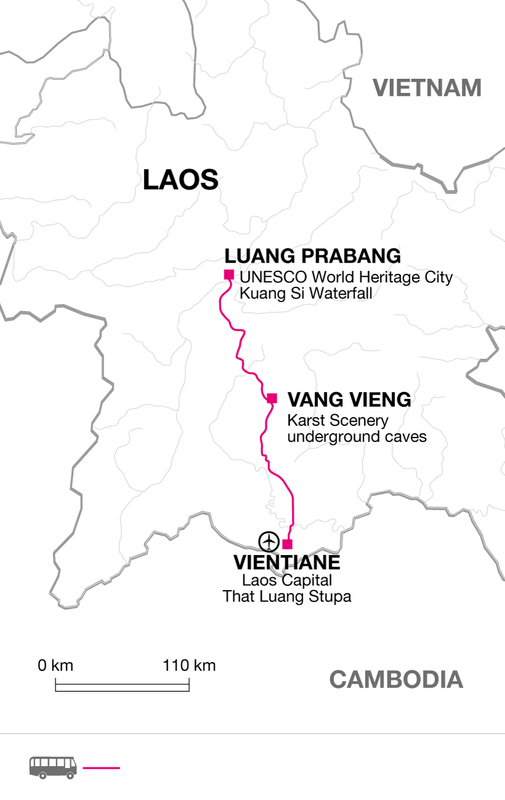 We plan to arrive in Luang Prabang in the late afternoon. Listed as a UNESCO World Heritage Site, Luang Prabang is nestled in a valley of lush rolling hills and sits at the confluence of two rivers, the Khan and the mighty Mekong. Influence from its French occupiers is peppered all over the city, with grand white-washed Indochinese villas lining its leafy streets, oddly complementing the golden-tipped wats (temples) found around almost every corner. Time moves so slowly here that it almost stands still, and a must-do is grabbing a Lao coffee, sitting down outside one of the many cafes and just watching the world go by, in traditional Lao-style. This evening there is chance to walk to nearby Mount Phousi and climb its 328 steps in time for sunset, offering excellent panoramic views over this sleepy city and beyond. Today we'll really get to have a closer look at Luang Prabang. All the main sights of interest are close together and we'll have a chance to walk around the various wats (temples) including the splendid Wat Xieng Thong (the Golden Temple built in 1559), which is strikingly decorated in brilliant red and gold designs, with an imposing tiled roof and mosaic dragon motifs. We'll also visit Wat Sen and the Royal Palace Museum. Afterwards we will board a traditional long-tail boat for the short journey up the Mekong River to Pak Ou Caves. There a number of steps to climb here as we make our way up the limestone cliffs to reach the sacred Buddhist shrine. Although now abandoned by the monks, there is an altar for incense burning, flower offerings and numerous rock shelves crammed with thousands of Buddha images of all shapes and sizes. After returning to Luang Prabang, the rest of the afternoon is at leisure. This morning we travel by bus to the beautiful Kuang Si Waterfalls, approximately 45 minutes from Luang Prabang. Passing forested hills and several ethnic minority villages we arrive at the limestone falls that cascade into several turquoise pools below. Returning to Luang Prabang, there is an opportunity to take an afternoon bicycle trip to the Lao Loum village at Ban Phanom. Approximately 6 km from Luang Prabang, the road gently undulates through cultivated scenery and arrives at a well-kept scenic village on the banks of the Nam Khan River. We will spend time meeting the locals and learning a little more about the everyday life of rural Lao before returning to Luang Prabang for a well-earned Beer Lao. Your trip finishes in Luang Prabang this morning after breakfast. The area of Laos and Thailand is tropical 'cool' from November to February, (15 to 27 Degrees Centigrade); 'hot' from March to May (up to 38 Degrees); 'wet' from June to October (rainy, hot and muggy). Bangkok and lowland areas are sticky all year round, but the northern highlands (Luang Prabang) are more temperate with a drier heat. The so-called 'cool' season can get very cold in the uplands at night and in the morning, bring a fleece. Please note prices are based on approximately 4- 6 participants and may vary up or down depending on group sizes. Lightweight rainwear is advisable all year. Bring a fleece to wear in the highlands as well as a hat and gloves in winter (Dec-Feb). Walking shoes, trainers & sandals. Should consist of a main piece of baggage and a daypack (suitcases are not recommended). Bring a torch, insect repellent, a waterbottle, sun glasses, sun hat and high factor sun cream. Although entirely voluntary, tipping is a recognized part of life in this region of the world. Some local staff will look to members of the group for personal recognition of particular services provided. In order to make things easier for you, the Tour Leaders may organise a group's tips kitty and if this is the case, they will account for it throughout the tour. Accordingly, you should allow US$ 20. US$ are the easiest to exchange in Laos. All major currencies and travellers cheques are exchangeable in the main towns. ATMs are available in most major towns and cities including Vientiane, Luang Prabang, Vang Vieng and Savannekhet. There is very limited credit card use. Travellers cheques are exchangeable only in the main towns. Laos: A single visa is required by UK, New Zealand, Australian, US & Canadian citizens and can be obtained on arrival. The visa on arrival costs 30USD for New Zealand and Australian citizens, 35USD for UK & US citizens and 42USD for Canadian citizens. For other nationalities the price varies between US$30-42. One passport sized photo is required to arrange this. Nothing compulsory, but we recommend protection against malaria, typhoid, tetanus, diphtheria, polio and hepatitis A. Consult your travel clinic for latest advice on different prophylaxis available against malaria. Although not compulsory, travellers may wish to immunise themselves against Japanese encephalitis. Please check the latest requirements with your travel clinic or doctor prior to departure. The above is not an exhaustive list. Further information regarding vaccinations and travel health advice can be found by following the NHS and NaTHNaC links at Explore Travel Health and from your local healthcare provider. Visa and vaccination requirements are subject to change and should be confirmed by you before travelling. This trip is perfect for those who are short on time and want to experience a flavour of Laos. It works equally well added on to the beginning or end of other trips within the region, adding a real palpable contrast to its South East Asian neighbours. The trip has plenty of options for activity, including a number of walks, cycling and kayaking so is well-suited to active individuals, although it is important to note these activities are all optional.